Karl Stefanovic went home sick. AN ILL Karl Stefanovic walked off the set of the Today show this morning and went home after just 40 minutes on air. 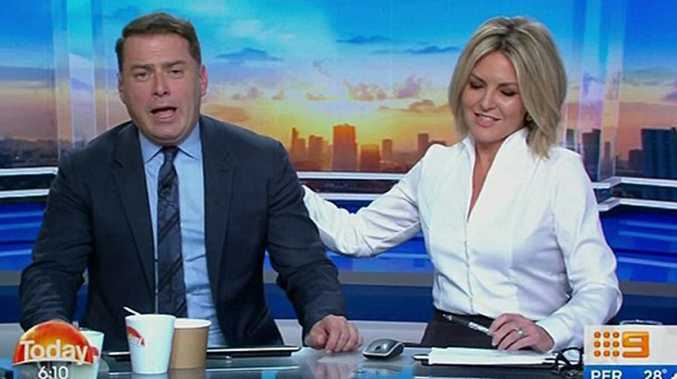 Stefanovic, 48, had been displaying flu-like symptoms since the Channel 9 breakfast show started at 5.30am and he decided to pull the pin just after 6am. "You've presented me with a sick note a little earlier, and I've a good read, and I think I might give you permission to go home," co-host Georgie Gardner said to Stefanovic. "Thanks, I don't feel very well," he replied. "Have a great weekend everyone. I'm taking an early mark." Gardner told viewers that Deborah Knight would fill in for Stefanovic for the remainder of the show. "We'll Glen 20 the chair I think," Knight joked. "Go to bed, for goodness sake!" Stefanovic then got up from his chair, grabbed a box of tissues and walked off the set of the Today show. Stefanovic's had a tough few months with reports he's set to be sacked by Channel 9 at the end of the year. Those reports, which came out in late September, claimed that Channel 9 bosses were preparing to let go of Karl after two years of unending negative publicity and a horror slump in the breakfast show's ratings. A damning report in The Sunday Telegraph quoted senior sources at the network saying that Stefanovic won't return to Today in the new year. Nine's chief executive Hugh Marks publicly issued a challenge to the star, describing 2018 as a "tough and challenging year for Karl and Today," and demanding the breakfast show lift its game. Karl Stefanovic and Jasmine Yarbrough at the 2018 Logies. The 44-year-old's messy marriage breakup, swift rebound with model Jasmine Yarbrough - almost a decade his junior - and embarrassing public trashing of his co-host Georgie Gardner have seen an ongoing slump in the show's female viewership.